Is your kids halfway through first grade yet still unable to learn? Is your preschooler fed up with coloring and ready with? Do you want to help your kids read, but they are afraid you’ll take action wrong? SRAs DISTAR® is easily the most successful beginning reading program open to schools in the united states. Research has proven that youngsters taught with the DISTAR® method outperform their peers who receive instruction using their company programs. Now for initially, the program has been adapted for parent and child to work with at home. Teach Your Child to Read in 100 Easy Lessons is often a complete, step-by-step program that shows patents simply and clearly tips on how to teach their children you just read. Twenty minutes per day is all you’ll need, and within 100 teaching days your little one will be reading with a solid second-grade reading level. It’s a sensible, easy-to-follow, and enjoyable method to help your youngster gain the primary skills of reading. Everything you’ll need is here — no paste, no scissors, no flash cards, no complicated directions — just you and your little one learning together. One hundred lessons, fully illustrated and color-coded for clarity, give your kids the basic and much more advanced skills necessary to become a good reader. 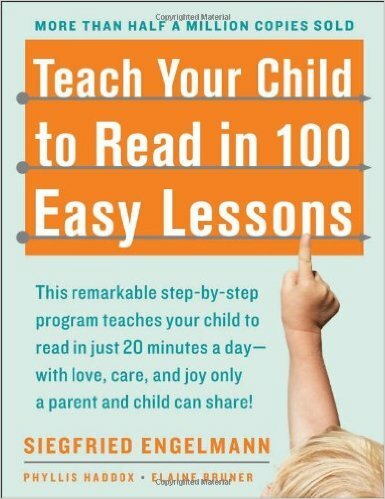 Teach Your Child to Read in 100 Easy Lessons will take you and your little one closer together, while giving your son or daughter the reading skills needed now, for any better chance at tomorrow. This entry was posted in Parenting & Relationships and tagged Teach Your Child to Read in 100 Easy Lessons.